I went onto ESPN.com to try to find some photos of last night's Game 4 of the NBA Finals -- specifically pictures of either the scrum at the end when Pietrus tried to break Gasol's back (which Gasol kind of earned by dunking in the final five seconds with the game in hand -- nice sportsmanship), or of Kobe elbowing Jameer Nelson in the face and then (surprise!) finding Derek Fisher, the hobbling assassin, for the dagger. Interestingly this morning, it was hard to hear anyone even mentioning the Kobe elbow as a factor in the game. The NBA's marketing and image people work hard to make sure everyone else is just a puppet. Nothing to see here! Just good, clean family fun! Kobe's a great guy! What a sham. Sure, there are some pictures of the game, but there are endless f-cking pictures of nonsense, including hugging, chit-chat and -- ooh! -- celebrities. And the broadcasters even were saying things like, "Well, you're used to seeing celebrities in New York or Los Angeles, but this is Orlando." Uh, yeah, did you know rich people can travel even more easily than us commonfolk? And did you also know that many, many star athletes (i.e., Tiger, Dwayne Wade, etc.) choose to live in Florida? And, also, that statement is stupid, Mike Breen, because didn't we see celebrities in Cleveland during the conference finals? Seriously, if they're there, they'll make there way to Orlando. It's on most maps. Anyway, the following photographs are taken from the game story gallery on ESPN.com. Serious journalists, they are. I mean, I can deal with ABC flashing Rhianna up on the screen with her name underneath -- that's fine. I don't care that she's there, but she cares that we all know she's there, so fine. But on a purported sports Web site? Whatever, I know I'm wasting my time here. Let's move along to the photos. 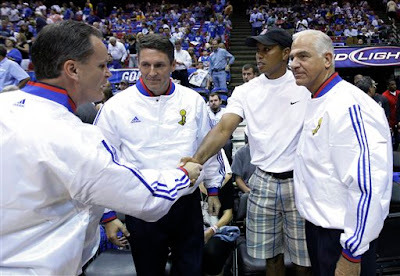 I don't know whether to give Tiger props for going out in an outfit any of us might wear (shorts, a cap, etc. ), or if I should come down on him for not dressing like a courtside celebrity should dress. His wife looks lovely, and he looks like he's from the school for exceptional people. "These guys make how much money? Hahaha... I have that in my freaking sofa cushions!" This is nice. 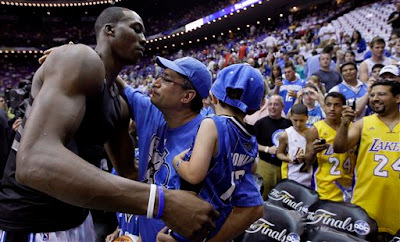 Dwight Howard hugging a fan. And then you see the two goobers in their Lakers jerseys without a shirt underneath. This is just wrong. Especially when you've got a gut like Goober #1 appears to. I'm sorry, but it's just terrible and you look like a tool. 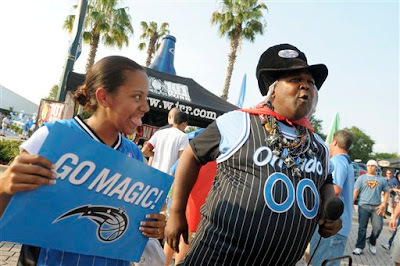 Basketball jerseys are not easy to pull off for fans, but if you're going to do it, at least wear a shirt underneath. This is the worst look you could go for with a basketball jersey. Oh, wait. I stand corrected.